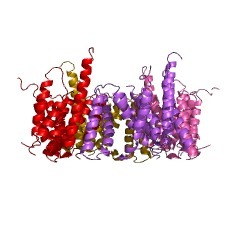 Presenilin 1 and presenilin 2 are polytopic membrane proteins, whose genes are mutated in some individuals with Alzheimer's disease. Distant homologues, present in eukaryotes and archaea, also contain conserved aspartic acid residues which are predicted to contribute to catalysis. At least one member of this family has been shown to possess signal peptide peptidase activity. 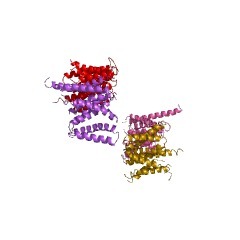 Presenilin 1 (PSN1) and presenilin 2 (PSN2) are membrane proteins, whose genes are mutated in some individuals with Alzheimer's disease. 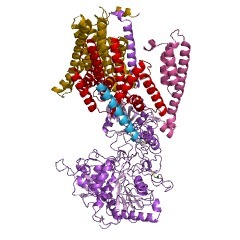 They undergo tightly regulated endolytic processing to generate stable PSN C-terminal and N-terminal fragments that form the catalytic core of the gamma-secretase complex, an endoprotease complex that catalyses the intramembrane cleavage of integral membrane proteins such as Notch receptors [(PUBMED:20482315)]. Presenelins are related to the signal peptide peptidase (SPP) family of aspartic proteases that promote intramembrane proteolysis to release biologically important peptides. 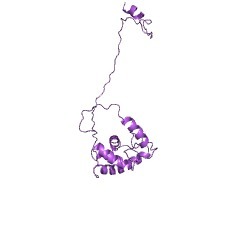 However, the SPPs work as single polypeptides. SPP catalyses intramembrane proteolysis of some signal peptides after they have been cleaved from a preprotein. In humans, SPP activity is required to generate signal sequence-derived human lymphocyte antigen-E epitopes that are recognised by the immune system, and are required in the processing of the hepatitis C virus core protein [(PUBMED:12077416), (PUBMED:22593157)]. 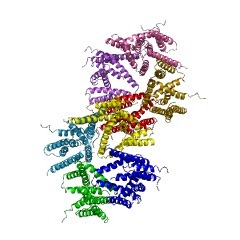 This group of aspartic peptidases belong to MEROPS peptidase family A22 (presenilin family, clan AD). There are 6435 PSN domains in 6426 proteins in SMART's nrdb database. Taxonomic distribution of proteins containing PSN domain. This tree includes only several representative species. The complete taxonomic breakdown of all proteins with PSN domain is also avaliable. Click on the protein counts, or double click on taxonomic names to display all proteins containing PSN domain in the selected taxonomic class. Intramembrane proteolysis promotes trafficking of hepatitis C virus core protein to lipid droplets. Hepatitis C virus (HCV) is the major causative pathogen associated with liver cirrhosis and hepatocellular carcinoma. The virus has a positive-sense RNA genome encoding a single polyprotein with the virion components located in the N-terminal portion. During biosynthesis of the polyprotein, an internal signal sequence between the core protein and the envelope protein E1 targets the nascent polypeptide to the endoplasmic reticulum (ER) membrane for translocation of E1 into the ER. Following membrane insertion, the signal sequence is cleaved from E1 by signal peptidase. Here we provide evidence that after cleavage by signal peptidase, the signal peptide is further processed by the intramembrane-cleaving protease SPP that promotes the release of core protein from the ER membrane. Core protein is then free for subsequent trafficking to lipid droplets. This study represents an example of a potential role for intramembrane proteolysis in the maturation of a viral protein. Identification of a novel family of presenilin homologues. 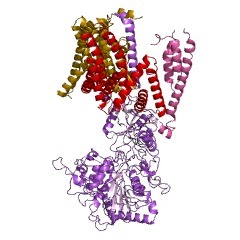 Presenilin 1 and presenilin 2 are polytopic membrane proteins, whose genes are mutated in some individuals with Alzheimer's disease. 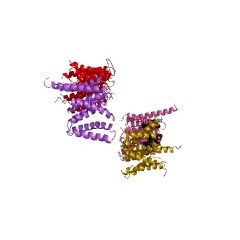 Presenilins have been shown to influence limited proteolysis of amyloid beta protein precursor (APP), Notch and ErbB4, and have been proposed to be gamma-secretases that perform the terminal cleavage of APP. In this model, two conserved and apparently intramembranous aspartic acids participate in catalysis. Highly sequence-similar presenilin homologues are known in plants, invertebrates and vertebrates. In this work, we have used a combination of different sequence database search methods to identify a new family of proteins homologous to presenilins. Members of this family, which we term presenilin homologues (PSH), have significant sequence similarities to presenilins and also possess two conserved aspartic acid residues within adjacent predicted transmembrane segments. The PSH family is found throughout the eukaryotes, in fungi as well as plants and animals, and in archaea. Five PSHs are detectable in the human genome, of which three possess 'protease-associated' domains that are consistent with the proposed protease function of PSs. Based on these findings, we propose that PSs and PSHs represent different sub-branches of a larger family of polytopic membrane-associated aspartyl proteases. 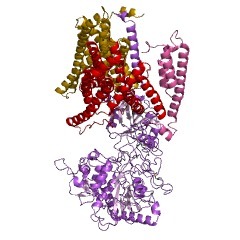 Identification of signal peptide peptidase, a presenilin-type aspartic protease. Signal peptide peptidase (SPP) catalyzes intramembrane proteolysis of some signal peptides after they have been cleaved from a preprotein. In humans, SPP activity is required to generate signal sequence-derived human lymphocyte antigen-E epitopes that are recognized by the immune system, and to process hepatitis C virus core protein. 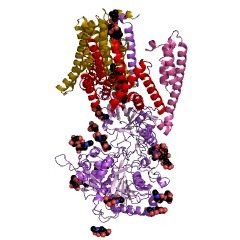 We have identified human SPP as a polytopic membrane protein with sequence motifs characteristic of the presenilin-type aspartic proteases. SPP and potential eukaryotic homologs may represent another family of aspartic proteases that promote intramembrane proteolysis to release biologically important peptides. 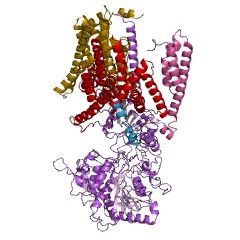 Presenilin and gamma-secretase: structure meets function. This information is based on mapping of SMART genomic protein database to KEGG orthologous groups. Percentage points are related to the number of proteins with PSN domain which could be assigned to a KEGG orthologous group, and not all proteins containing PSN domain. Please note that proteins can be included in multiple pathways, ie. the numbers above will not always add up to 100%.